Italian meatballs is the ultimate comfort food, and this is the ultimate version of that comfort food. It only takes 30 minutes to prep and is the best meatballs recipe ever! Assembling the sauce and meatballs only takes about 30 minutes tops, and then it is left to simmer in the crock pot. You could easily prep this meal before leaving for work in the morning, or during lunch break for an evening meal. All you have to do later is cook up your favorite regular or gluten-free pasta to serve with it. Gourmet spaghetti and meatballs in no time! 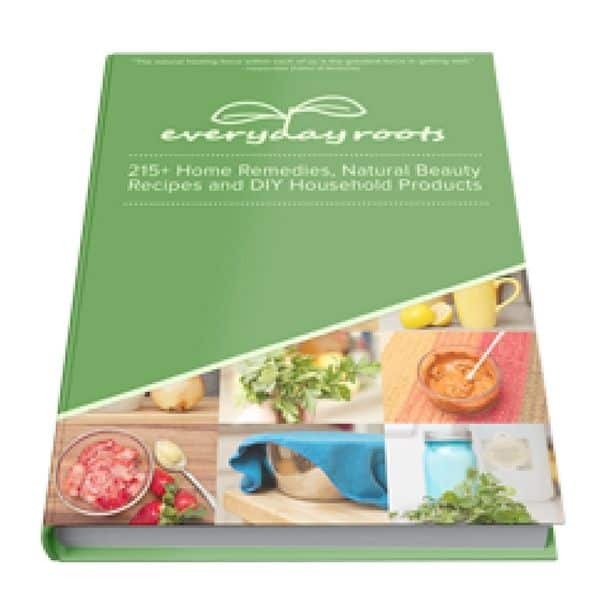 There are a couple of recipes my husband’s mom makes that I cannot replicate, no matter how hard I try. Of course, my gracious husband never says anything about it. I asked him point-blank which recipes he misses. First is her baked buffalo chicken wings. Second is her homemade spaghetti. Up until this point, I think I was cursed when it came to making spaghetti sauce. Every time I attempted homemade spaghetti sauce, it tasted way too acidic and just… blah. And I really don’t know why. My guess is that I just threw everything in the crock pot, put in pretty much zero effort, and overcooked it. Then, I stumbled across this GEM of a spaghetti and meatballs recipe the other day when I was experimenting in the kitchen. It takes a *little bit* more effort than throwing stuff in the slow cooker, but not much more. And the taste results are BEYOND worth it. Even better, this recipe can be made gluten-free and/or keto with a couple simple tweaks! Psst… you’ll want to pin this recipe for later. Definitely. First, assemble the homemade marinara sauce in your slow cooker. Mix together the crushed tomatoes, tomato paste, broth (or water), onion, garlic, honey, and spices. The honey is used to balance the acidity of the tomatoes. 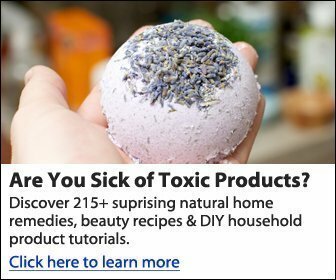 You can use sugar instead, but that wouldn’t be as healthy, now would it? Tsk, tsk. Turn your slow cooker on HIGH. Next, heat a large skillet on medium heat with a couple tablespoons of oil. 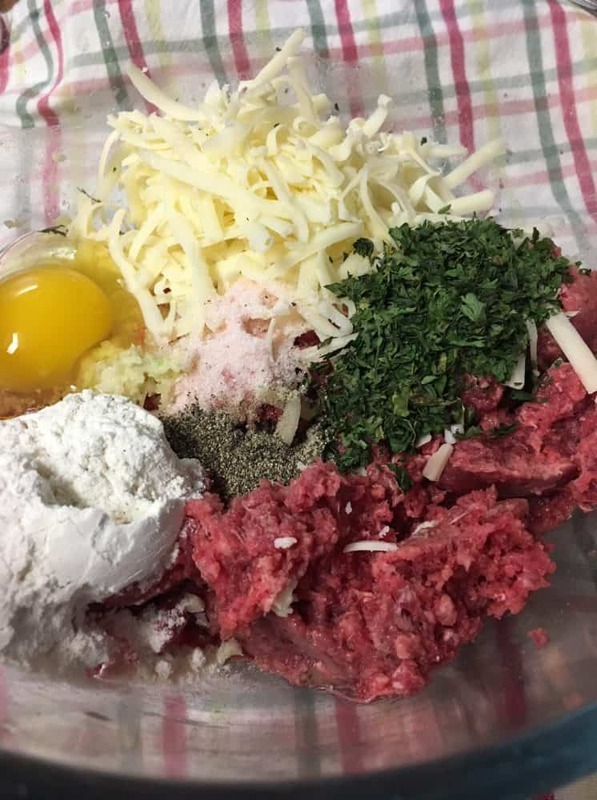 In a large bowl, add all the ingredients for the meatballs – ground beef, egg, flour (we love this non-GMO kind), sharp cheddar, garlic, parsley, salt, and pepper. 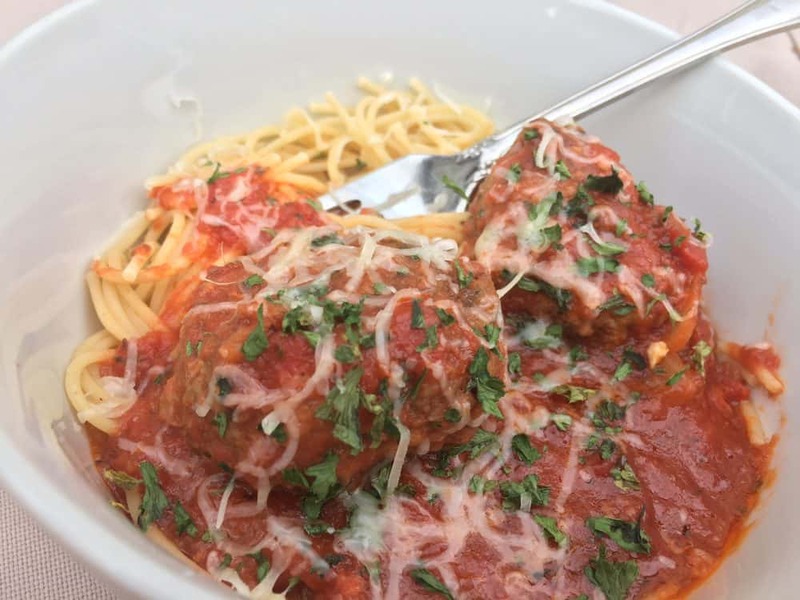 The garlic is what gives the meatballs their out-of-this-world flavor. Don’t skimp on it! I like using a garlic press for this recipe since it uses a lot of it (this one is my favorite). 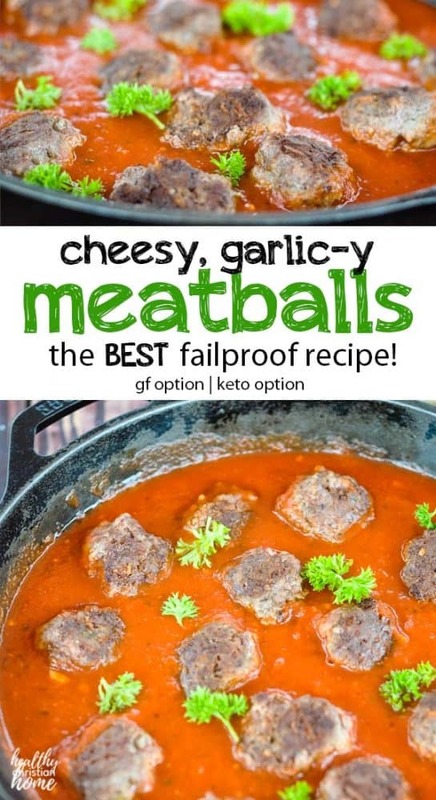 ALWAYS grate your own cheese with a box grater for these meatballs. Actually, grate it for every meal. The pre-grated stuff should be banned – the flavor just doesn’t compare. One widely available brand of cheese that is INCREDIBLE is Cabot Extra Sharp Cheddar. You can find it at Wal-Mart, among other places, and it tastes like gourmet cheese we used to eat in Scotland for the price of a regular block of cheddar. Use fresh parsley to level-up this recipe. I didn’t have any so I just used dried, and it was still fantastic. And don’t be too shy with the salt here… use the amount recommended if possible (nobody likes a bland meatball)! 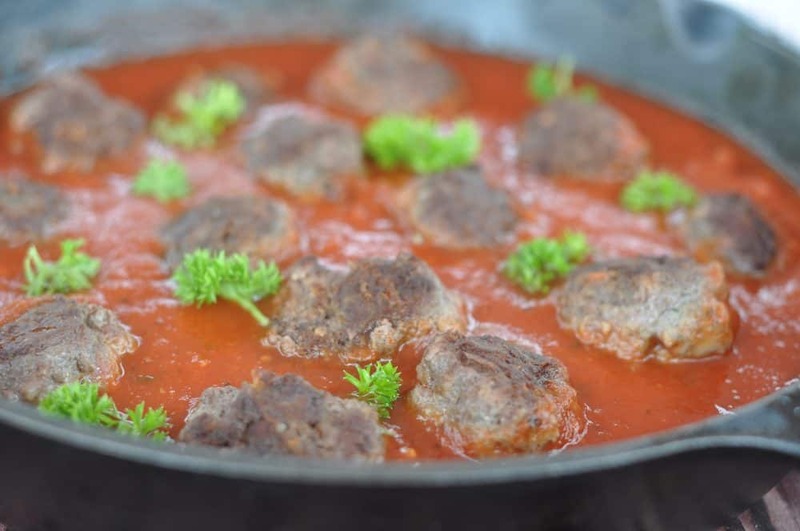 Get creative and use these meatballs in a variety of ways – meatball subs, incredible Swedish meatballs, Italian wedding soup, in a curry, on top of pizza… the possibilities are endless. For a gluten-free option, grab your favorite GF noodles to use instead, and use almond flour instead of regular flour in the meatballs. Easy peasy! 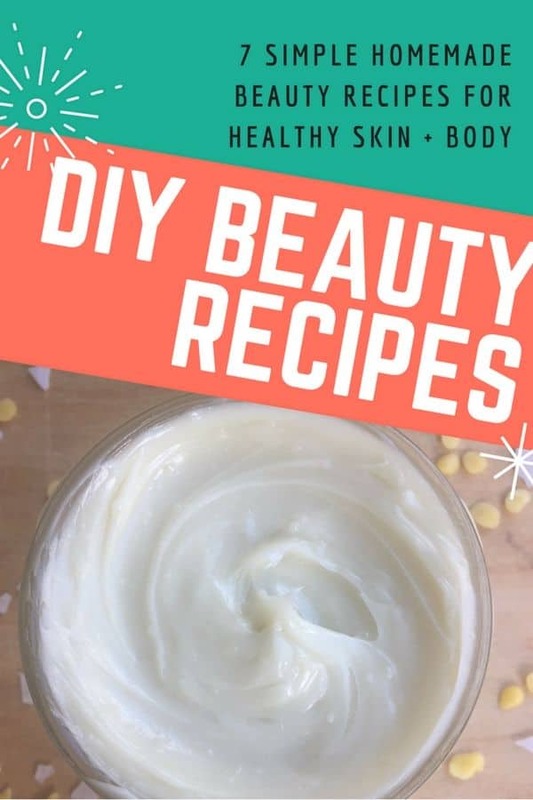 To make this recipe keto-friendly, omit the small amount of honey in the marinara sauce, and use almond flour instead of regular. 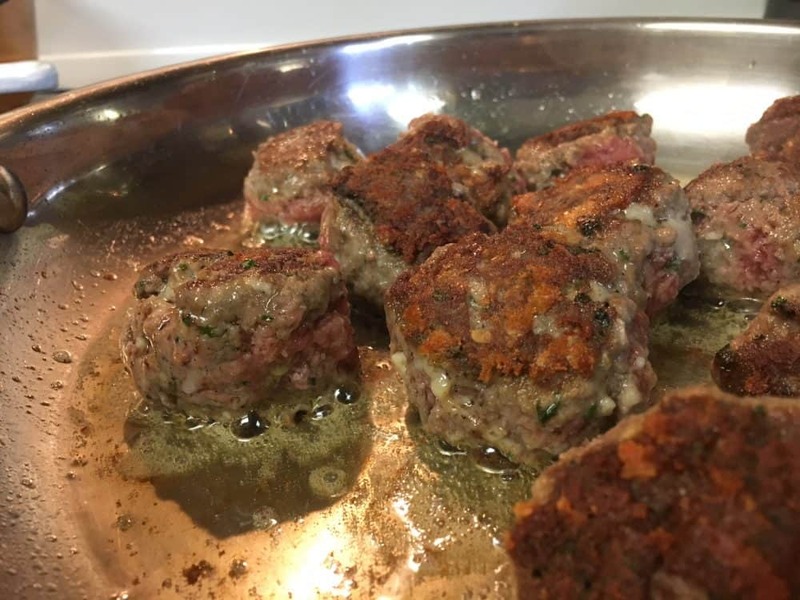 You can substitute ground chicken or pork for the beef in this Italian meatball recipe. Using fresh herbs instead of dried will make the flavors in this spaghetti and meatballs recipe even more over-the-top. Cheese is included in the Italian meatballs, but if you’re dairy-free, feel free to omit them. 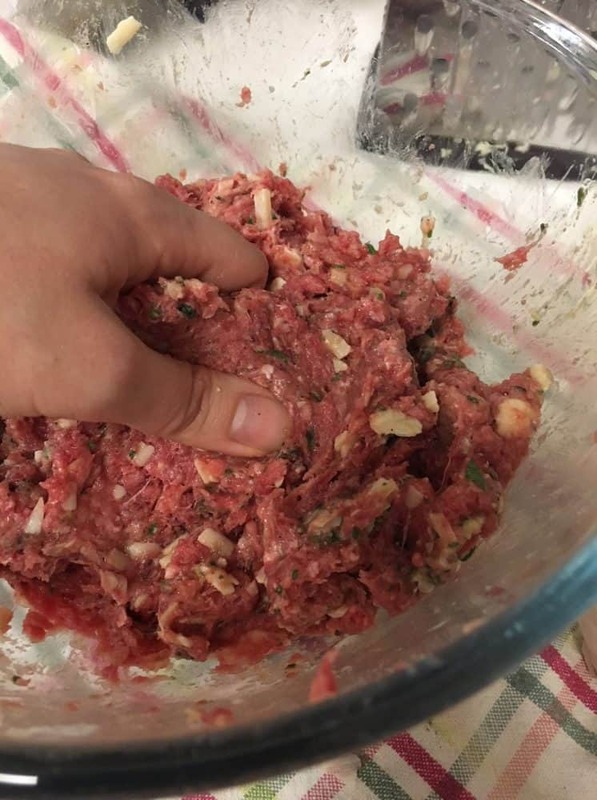 When the meat mixture is well combined, shape into small balls. 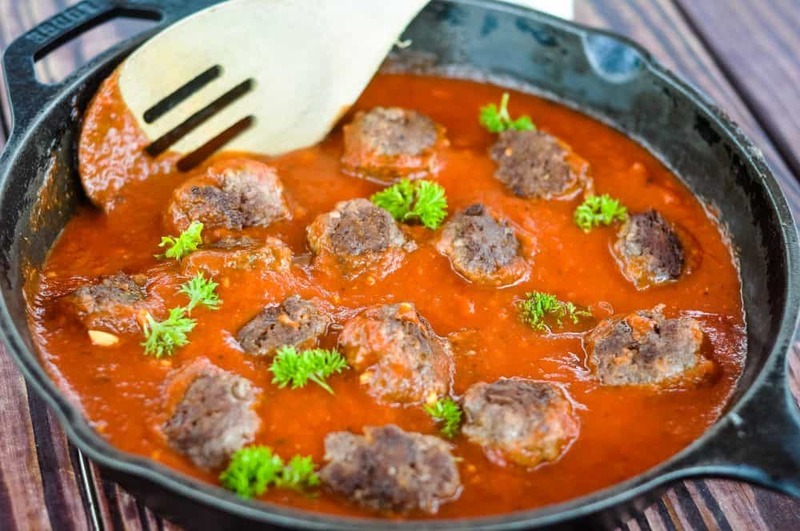 Drop the meatballs into the hot skillet and cook for several minutes, allowing them to get nice and brown on one side. When they’re brown, flip the meatballs (I like to use metal tongs). The goal here is NOT to cook the Italian meatballs through – it’s just to brown the meatballs and get the outside nice and crispy. They will do the remainder of their cooking in the marinara sauce. Tip: Don’t stir the meatballs around in the pan, or you will risk them falling apart. Just gently flip them with the tongs or a spatula. If they stick, you may have to use the underside of the tongs or a spatula to gently loosen them. To prevent sticking, get the skillet (and oil) nice and hot before adding the meatballs. A cast iron skillet like this is actually the best pan to cook them in. When your Italian meatballs are browned (but still pink in the middle), gently transfer them to your slow cooker with the marinara sauce. Allow to cook for 2-3 hours on high, 4-6 hours on low. 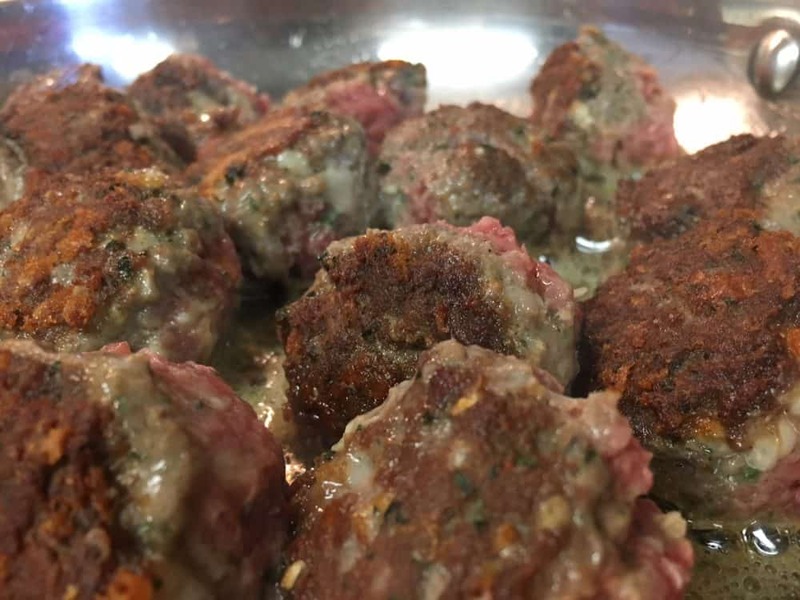 The result is tender, garlicky, cheesy, melt-in-your mouth meatballs that are better than any Italian meatball recipes you’ve ever tasted! Serve over your favorite pasta. We like to grate a little more cheese on top for serving, as well. 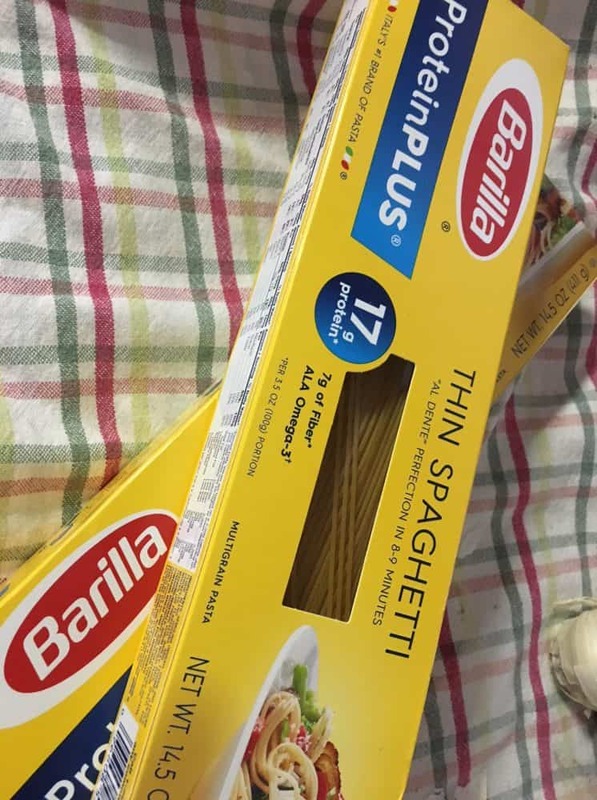 Note: We LOVE the Barilla Protein Plus Thin Spaghetti. It tastes exactly like traditional white pasta, but it’s a little healthier with lentils, chickpeas, and flaxseed added to the wheat. You seriously can’t taste the healthy add-ons at all, and it’s got a great texture. Barilla also makes a gluten free pasta if you want to go that route. This gourmet spaghetti and meatballs recipe is wonderful alongside my favorite tomato, cucumber, and onion salad – or just about any salad you can imagine! You must go forth and make this homemade spaghetti and meatballs. Today. 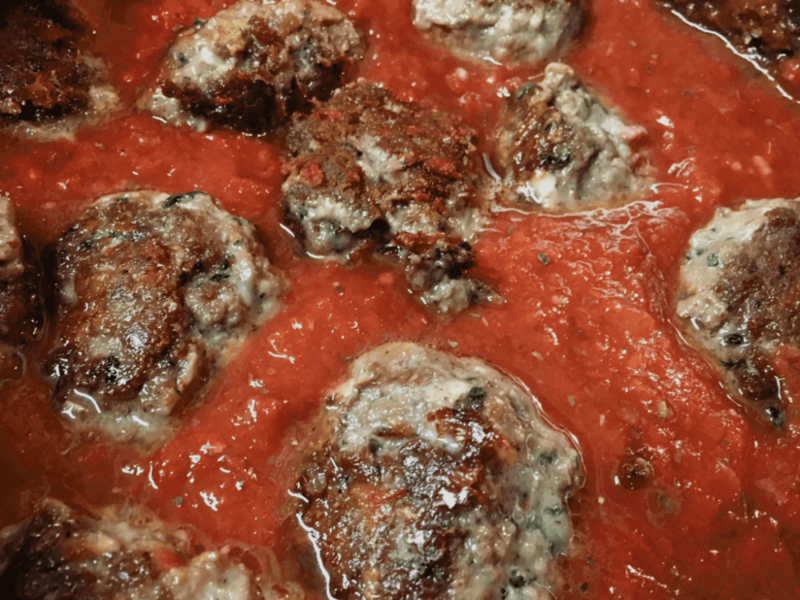 Melt-in-your-mouth, cheesy, garlic-y, Italian meatballs in homemade marinara sauce. 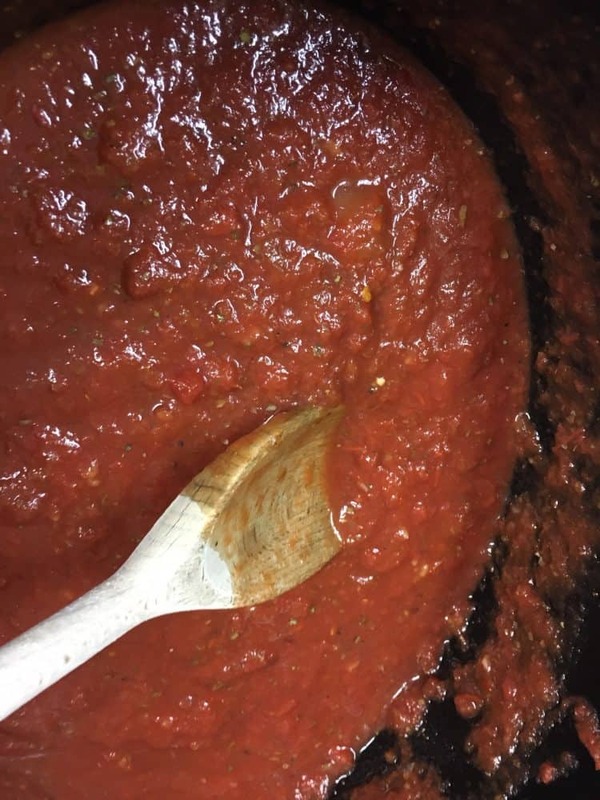 Mix all ingredients for the marinara sauce in a slow cooker and turn on HIGH. Heat a large skillet on medium. In a large bowl, combine all ingredients for the meatballs and mix well. Shape into small balls. Cook meatballs in the hot skillet for several minutes on one side, until starting to brown. Flip over gently with tongs (do not stir) and cook on the other side. Meatballs will still be pink in the center. 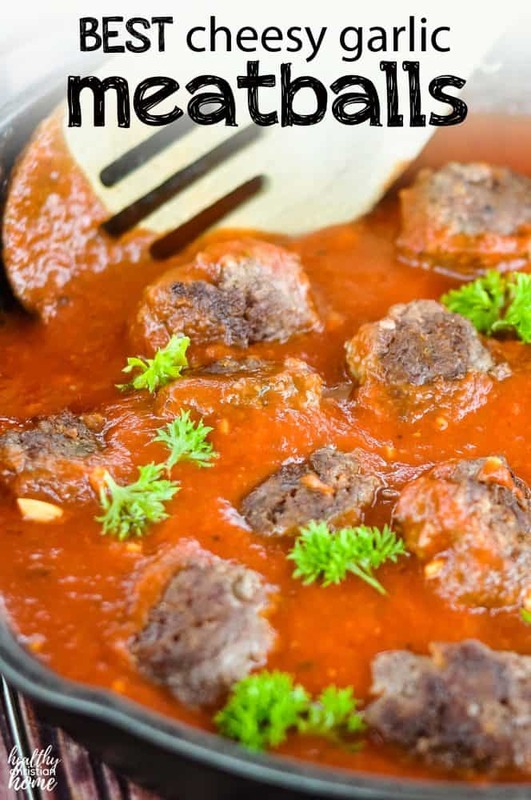 Transfer the browned meatballs to the slow cooker with marinara sauce. Cook on HIGH for 2-3 hours, or LOW 4-6 hours. Serve over your favorite pasta. 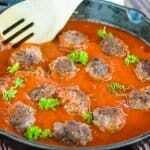 To eliminate the slow cooker option, you can cook these meatballs on the stovetop in the marinara sauce on medium low for about an hour. For a gluten-free option, replace regular flour for almond flour. For a Keto option, omit the honey in the marinara sauce also. What’s your favorite Italian recipe? Comment below!